Home > Siber Systems, Inc.
RoboForm for Palm allows you to view RoboForm Passcards, Identities and Safenotes on Palm-compatible device. Full-featured password generator is included. 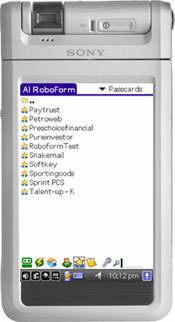 The RoboForm for Palm device or software seems to be old or discontinued. Such programs or devices are no longer available and supported by their original developers, or are simply obsolete for their purpose. Sometimes companies offer limited support through their website. If you need more information please contact the developers of RoboForm for Palm (Siber Systems, Inc.), or check out their product website.